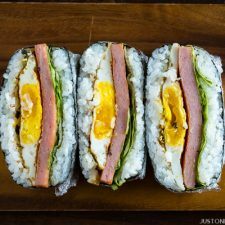 Spam Onigirazu is perfect for a quick meal or snack on the go. 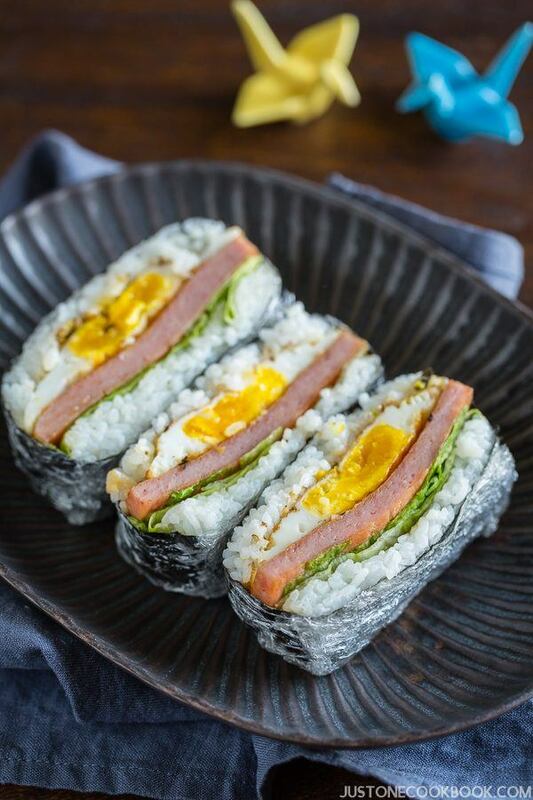 The winning combination of fried eggs, sweet sushi rice, and classic spam wrapped up in crunchy nori. You want to sink your teeth into this yummy treat! 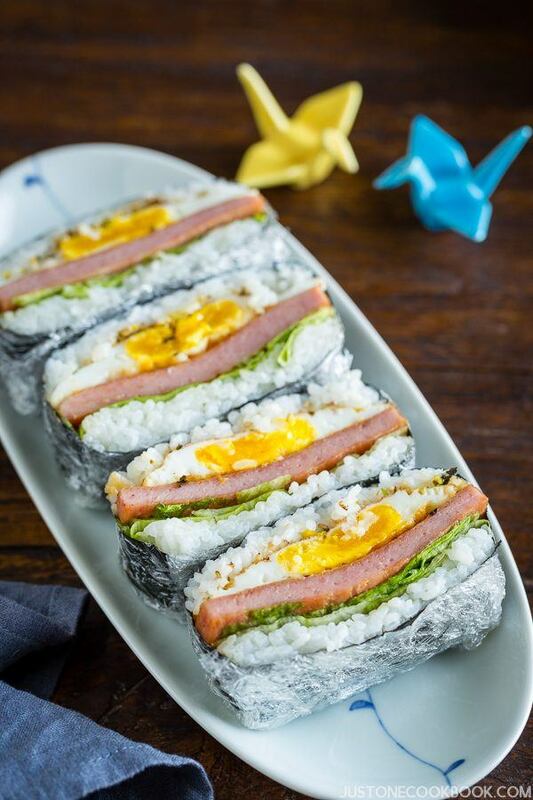 If you love a popular Hawaiian favorite SPAM® Musubi, you will LOVE this SPAM® Onigirazu (スパムおにぎらず). 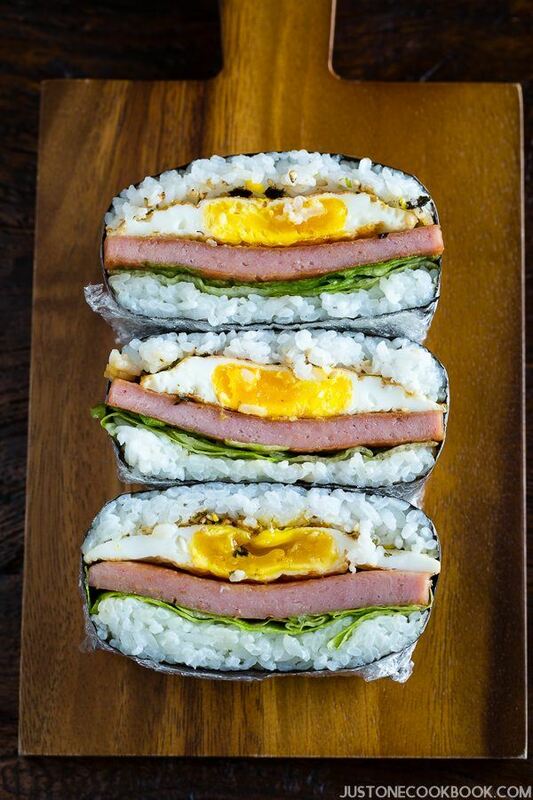 The ingredients are similar to classic musubi; all you need is SPAM® product, rice, and nori (seaweed) sheet. The biggest difference is that you could add more fillings in Onigirazu, and today I added lettuce and fried egg to make it more like a breakfast dish. This combo of deliciousness is potable and hearty enough to fill a hungry stomach anytime of the day. You’ll love it for picnic, road trip snack or plane food too! A popular snack and lunch dish in Hawaii, SPAM® Musubi is made of a thinly sliced grilled SPAM® product on top of rice pillow. The SPAM® product and rice is wrapped together with nori (seaweed sheet), almost look like Tamago Sushi. It is sweet, salty, filling and extremely addicting. 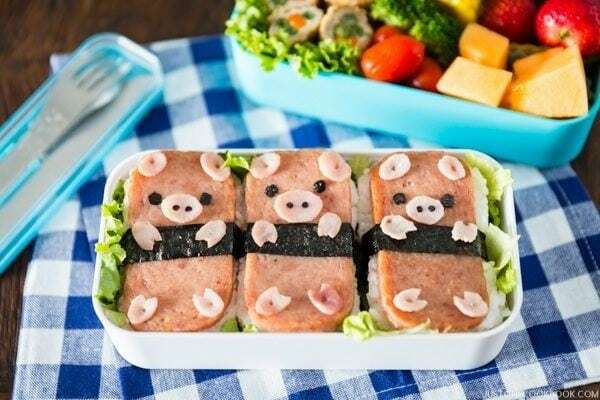 If you like to get creative, check out the cuter version of Piggy SPAM® Musubi which I made a while ago to surprise my children. SPAM® Onigirazu is a little bit fancier version of SPAM® Musubi. 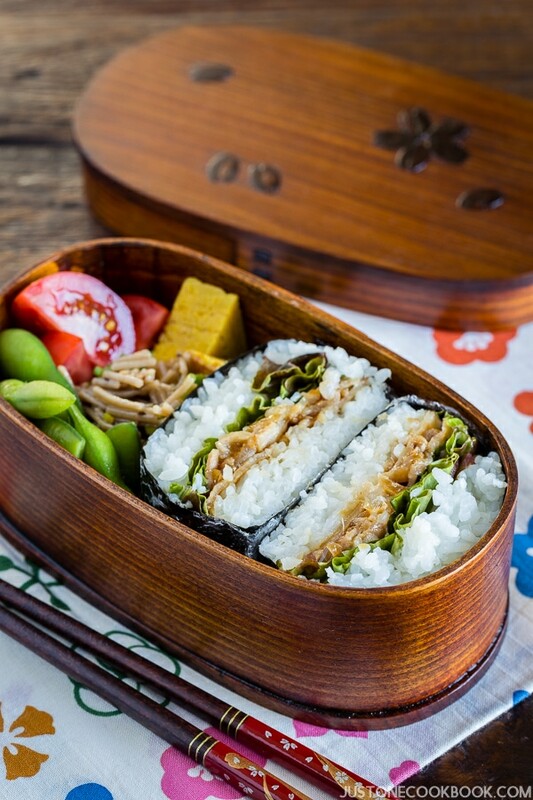 You could add more ingredients and make it more delicious as onigirazu hold more fillings inside. If you’re not familiar with onigirazu, it’s basically a rice sandwich; instead of making a triangle/round onigiri (omusubi), we make a rice sandwich with more fillings. I made a video on how to make it here, and I have also shared my Chicken Katsu Onigigirazu and Bulgogi Onigirazu recipes on my blog (and more recipes coming soon!). As the SPAM® product is a bit on the salty side, I like to add fried egg to make it more balanced, while lettuce (especially iceberg lettuce) gives a crunchy and refreshing texture. 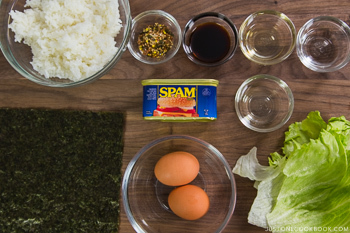 SPAM® product is usually cooked with soy sauce for musubi, so I season the SPAM® product the same way in this recipe. Soy sauce, mirin, and sake – the most important 3 ingredients for typical Japanese flavors. 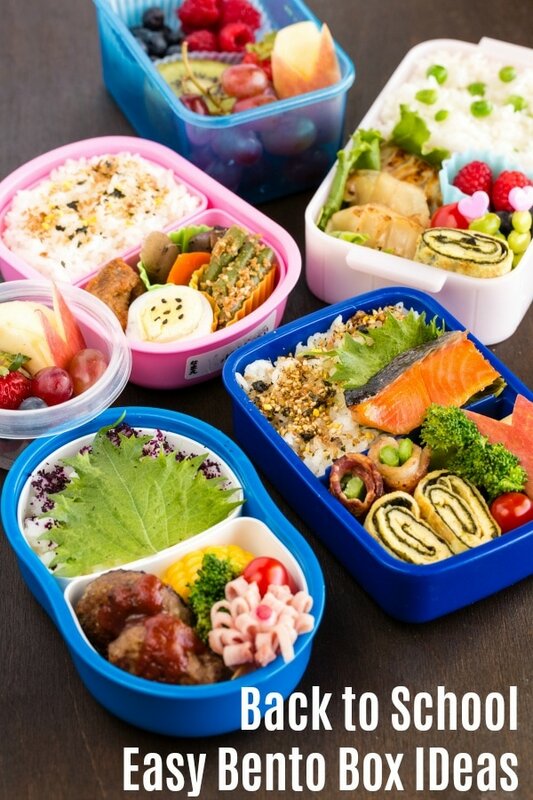 My children absolutely love onigirazu and it’s one of their most requested lunch items. As next week (June 12 – 18) is Hawaiian Foods Week, I got the idea for this recipe while grocery shopping and saw SPAM®. As many of you know, SPAM® products are a part of life in Hawaii. It’s served everywhere, from grocery stores, delis to fancy restaurants. Even McDonald’s features several SPAM® items on their breakfast menu. 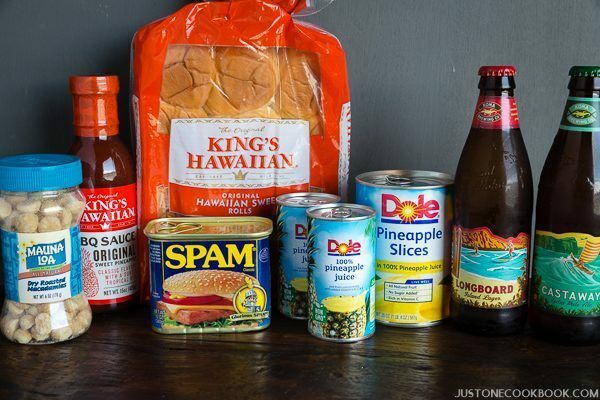 Starting next week, I will be celebrating Hawaiian Foods Week with many of the brands you know and love, which include King’s Hawaiian, Dole, SPAM®, Kona Brewing Co. and Mauna Loa. After making the onigirazu for my children, I made several sandwiches with King’s Hawaiian rolls, SPAM® product, and King’s Hawaiian BBQ sauce for Mr. JOC. He thoroughly enjoyed the combination, and it’s now made the list as one of our quick meal ideas. Mark, one of JOC readers from Oregon, kindly sent me this beautiful onigirazu mold that he handcrafted. It’s made of Port Orford cedar and there is not a single nail used in this mold. Thank you Mark! If you want to purchase this mold, please click onigirazu mold page for details. Heat 1 Tbsp. vegetable oil over medium high heat in the frying pan and cook the eggs as you like. I made the egg “over hard” (over well), which is a fried egg turned over and cooked until the yolk is solid. Make the eggs in batches if necessary, and transfer to a plate when they are cooked. Meanwhile take out the spam from the can and cut into ¼ “ (6 mm) slices. You’ll get about 6-7 slices. Once the eggs are cooked, add the spam slices to the pan and cook both sides until nicely browned. Transfer the spam slices onto a plate. Turn down the heat to medium low and add 1 Tbsp. mirin, 1 Tbsp. sake, and 1 Tbsp. soy sauce. Mix well quickly. Transfer the spam slices back to the pan and coat well with the sauce. Place a plastic wrap on a working surface and put a sheet of nori seaweed on top (shiny side facing down), with a corner pointing up. Evenly spread the steamed rice in a thin layer and form into a square shape in the center of nori sheet. I’m using the onigirazu mold (read more about it here). Sprinkle a little bit of kosher salt and furikake. 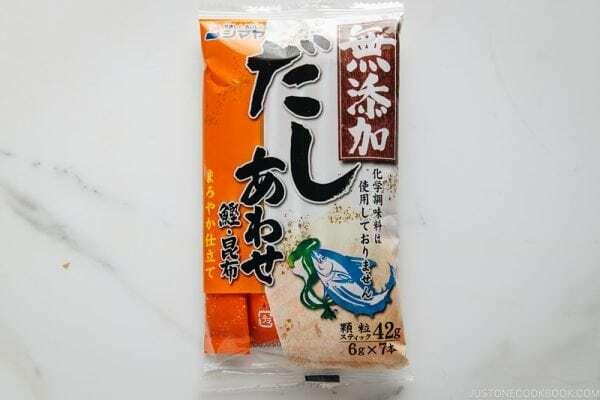 Salt is added to prevent the food from spoiling as we eat onigiri, onigirazu, and bento at room temperature and typically without refrigeration. 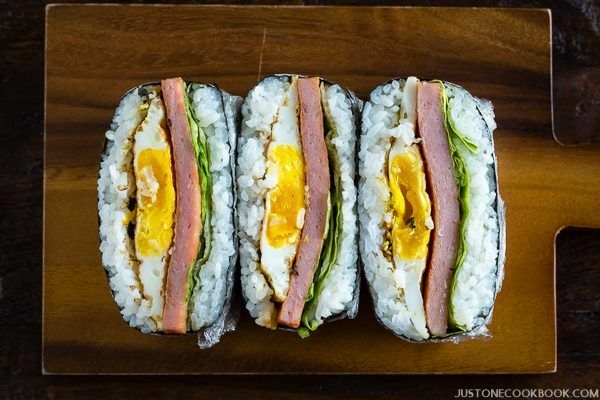 Place the fried egg and spam slice on top. Place the lettuce and thin layer of steamed rice on top, maintaining a nice rectangular/square shape. Now if you have an onigirazu mold, pull up the mold carefully. Remember to moist the “lid” before you press down so rice does not get stuck to it. Bring left and right corners of nori sheet towards the center. Fold gently but tightly to wrap around the layers at the center. Then bring bottom and top corners towards the center. Continue to fold gently but tightly around the layers. Make sure the rice is tucked in nicely. 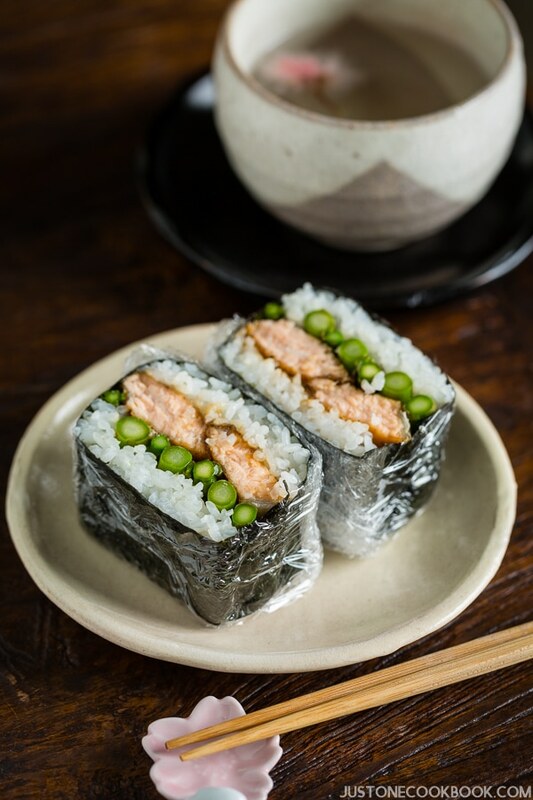 If you like your onigirazu to showcase the filling after cutting in half, mark with a piece of rice or lettuce strip perpendicular to the filling. When you add the filling, you can decide which way you want to cut so it looks the best when the ingredients are revealed. Wrap tightly with plastic wrap. Set aside for 5 minutes with nori’s seam side down. Cut the onigirazu with a sharp knife (following the mark that tells you which direction to cut). Run your knife in running water before cutting so that the cross-section will be clean. If you plan to make this the previous night, wrap the onigirazu with kitchen towel and keep in the refrigerator overnight. The towel will prevent the rice from getting hard from the cold temperature. Eat within 24 hours. I use this Onigirazu Mold, but it's not necessary. Please use this tutorial for guidance. If you're interested in purchasing this wooden mold, please click here for more information. Full Disclosure: This is a sponsored conversation written by me on behalf of King’s Hawaiian. The opinions and text are all mine. Learn something everyday! 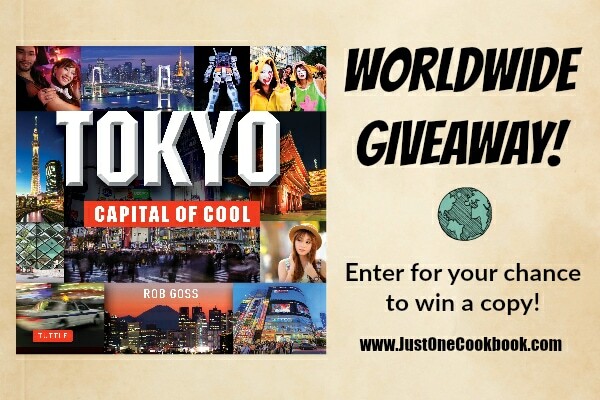 =) I took a look at the website to check it out, maybe it’s more for the continental US since you can win a trip to Hawaii. Wouldn’t be much use for people already living here. lol Yup, he’ll like that it’s waaay bigger! =D Thank you for sharing this! I don’t have any kids, but I would definitely make this for myself. All I would need is Spam. Not sure if it is sold in Barbados, so I’ll have to go shopping to find out. I remember it being sold in the US and Canada, but I don’t recall seeing it sold here. Ah, well. If I can’t find any I can always use a substitute. Thanks again, Nami! Thank you Miko for your suggestions! Aloha Namiko! Favorite Hawaiian foods, oh my! Lau lau, kalua pork, lomi lomi salmon, chicken long rice, smoked pork, haupia, furikake salmon, butter mochi, pie crust manju, warabi salad, Okinawan sweet potato tempura…the list could go on and on…most of these are local favorites that can be found in a plate lunch style restaurants, okazu-ya, or kitchens throughout the islands. So many ono (delicious) choices here in Hawaii! Thank you for sharing your version of SPAM onigirazu! 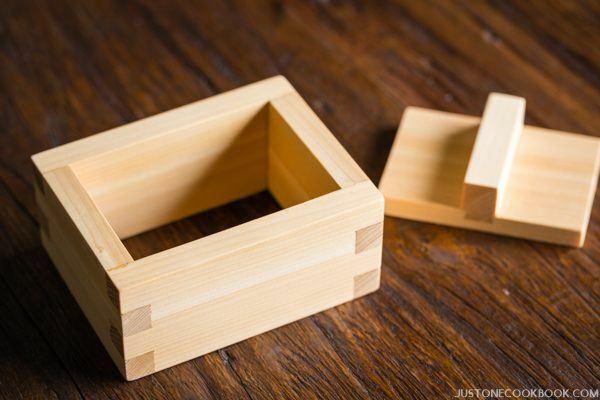 Does this Mark sell his beautifully crafted onigirazu molds? I have a plastic one,,but love this one! Hi Leslie! Yes, it’s great meal on the go. I meant to try the onigirazu ‘sandwich’ but haven’t gotten around to it yet. It looks delicious as the creations you post always do. One of my favorite Hawaiian dishes that is so easy to make is Kailua Pig and cabbage. My daughter loves Spam Musubi. I made it once and used teriyaki sauce instead since I didn’t know what type of sauce they put in but my daughter liked it anyway. I will try this recipe, it looks so yummy! Thanks for sharing. Hi Agnes! If you have soy sauce, mirin, sake, (sugar), you can make teriyaki sauce at home and no need to buy and keep extra bottle in your fridge. 🙂 Hope you enjoy! That’s really nice craftsmanship on the onigirazu mold that Mark sent you! And it’s really pretty. As is this dish! Great way to use Spam, too — one of those foods most of us forget about. Thanks! Hi Nami..if I store it overnight in the fridge will the nori seaweed be soft in the morning? Hi Angie! The nori for onigirazu has to be soft anyway. 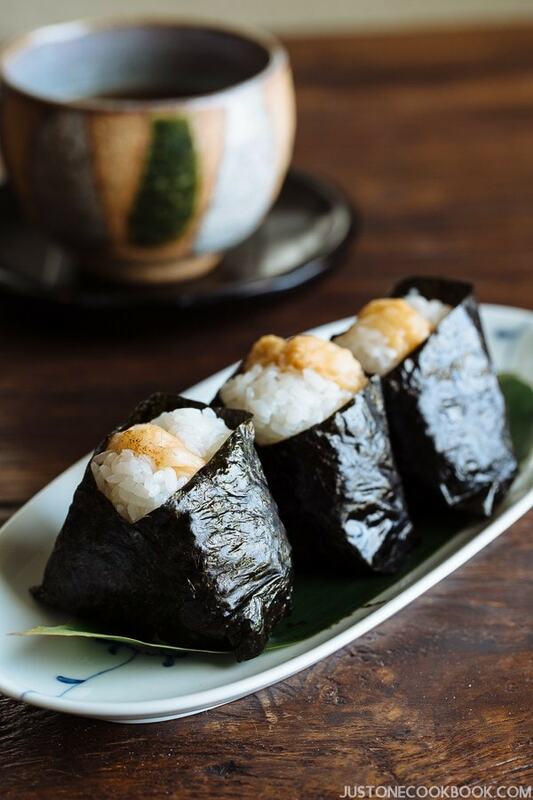 To be able to wrap nicely, we use warm rice for onigirazu. So nori is naturally wilted by the time you cut in half. Nori won’t be crispy. 🙂 Hope this helps! We love onigiri! These are awesome with spam and egg. My husband would be so thrilled to have these for lunch. Can’t wait to try them. Hi! What kind of Nori should I get? I find that the ones I bought always end up becoming chewy after the rice is in. My child has a hard time biting off the sushi/onigiri with the chewy seaweed. Wonderful idea! Egg is a perfect complement to spam. I’m surprised no one has thought of this before. Japanese/Hawaiian version of the Egg McMuffin. Hi I was wondering how long this would keep in the fridge? I love your spam musubi & yakisoba. I made this this morning for breakfast since it has snowed here in Tokyo and the kids did not have school. Tasted great but the nori seemed to crack as I folded it. I am sure I put the shinier side down. I don’t suppose you have a video of you doing the folding? Maybe it takes practice. And, I did not have a mold to make the ingredients nicely compact and shaped properly. I will try again, though! What could I do to substitute sake? I am not old enough to buy it.